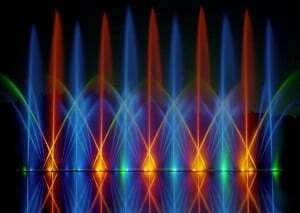 We are the leading commercial light fountain show company with clients all over the world. Our family has been in the business for over 70 years and we are committed to providing an unrivalled level of service. Fountains can be installed by our professional team outside or indoors; wherever a system is located you can rest assured that it will be bright and clearly visible in optimal conditions. Our products are sized to your requirements and can feature overhead lighting to be electronically raised or lowered as desired. A commercial light fountain show is perfect for attracting large crowds to your business and every element is completely customisable. Choose the colours and routines that best suit your organisation – our displays can be soothing or exciting, graceful or energetic or whatever you wish! A Liquid Fireworks installation is amazing value for money and requires little maintenance. Light fountain shows are popular attractions that audiences will pay to experience; our events really are that memorable and captivating! By utilising high-tech dichroic filters, each fountain is up to four times brighter than the standard level. Some of the world’s most famous venues host Liquid Fireworks’ shows including Sea World, Disney and Universal Studios. We have been the leading commercial light fountain show company since German inventor, Otto Przystawik, conceived the idea in the 1920′s. Since then, three generations of the Przystawik family have helped our business become the world’s only manufacturer dedicated exclusively to the development and construction of music fountains. Contact us over the phone by calling (239) 574-5181 or you can email sales@liquidfireworks.com and we will get back to you as soon as possible.